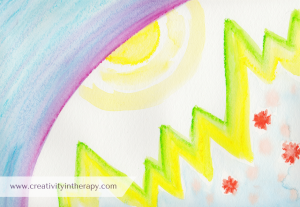 Using the art process to help clients express and explore their emotions is at the core of art therapy, but there are many different ways to do this. Sometimes the emotions are expressed unexpectedly or naturally arise from a directive that is not directly about feelings. 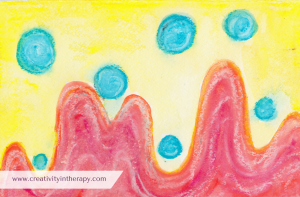 For example, in “playing” with watercolors through a sensory-based activity, the client might discover that emotions are coming up in themselves or through the art. Or a prompt for a client to create a collage about family is likely to lead to an exploration of feelings that are reflected in the chosen images. At other times, the therapist might want to more directly encourage the expression or exploration of emotions through art. They might set up a directive in a way that will enhance affective processing or will directly give clients a prompt to make art related to their feelings. Why is it helpful for clients to express emotions through art? Art can provide a healthy outlet for feelings that clients need to get out. Art is an alternate way to communicate something that clients cannot always put into words. 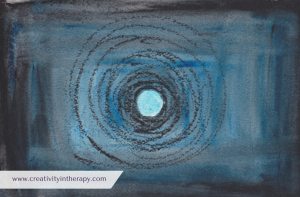 By witnessing the art, the therapist gives the client the experience of validation and acceptance of their feelings. The art can provide safe containment for emotions that are expressed. Art exercises about emotions help clients to be more in touch with and aware of their feelings. Reflecting on the art can give clients new understanding and insight about their feelings. 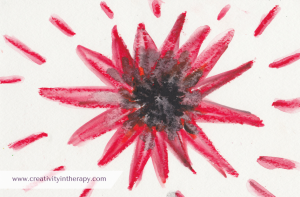 Art can help clients differentiate between different feeling states. 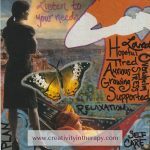 Encouraging client to express their feelings in art is something that I have often done as a therapist, in many different ways over my years as a therapist. 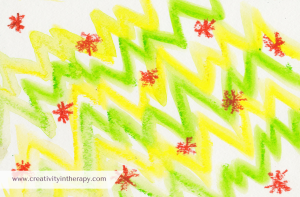 For example, I have asked clients simply to “draw or paint what you’re feeling today.” I have suggested that they draw what anger, depression, or anxiety look like to them. I have done art about feelings and needs. I have tried feelings mandalas (draw what you’re feeling in the inside of the circle and then what is going on in your life on the outside). I have done feelings hearts and pie charts with kids who have trouble opening up about feelings. I often suggest that overly anxious or angry kids make a monster to represent the feeling. All of these have been helpful for different clients and situations, and I continue to use them when they are appropriate. 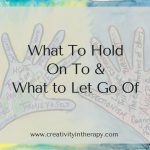 However, sometimes the idea of drawing or painting feelings can be really challenging for client who aren’t used to thinking about their emotions in the language of color or metaphor (or who aren’t used to paying attention to their feelings at all). So, I have started using a sequence of 6 pictures to help clients better understand and express their emotions. Each of the drawings/paintings is fairly quick for two reasons. One, doing the pictures quickly keeps clients from over-thinking their responses. 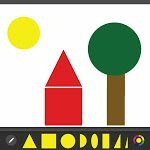 Two, this allows enough time to do all six images within a one hour therapy session, including time for check in, setup, and discussion of the art. It is still challenging for some clients to try to think and express themselves through the art, no matter what directive you give them. And some clients still worry about the final art product looking good or tell me that they don’t like this exercise because they don’t want to pay attention to their emotions. 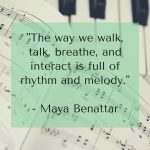 But many clients have told me that this has been a helpful exercise for them to be able to get in touch with their emotions and to feel some relief through being able to express them. When I’ve done this in a group setting, there is the additional benefit of experiencing one’s emotions accepted and witnessed by the whole group. Group members are often able to relate to each other and enjoy discussing the common connections that they see. For the scribble warm-up, I encourage clients to cover the first page with scribbles and lines, experimenting with how their materials feel and how many different types of lines they can make. 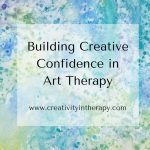 Especially for clients who are not as used to doing art in therapy, this helps them to become more comfortable with the art process and become engaged through a prompt that can really have no right or wrong. For each of the emotions, I encourage clients to do an abstract picture and avoid words, faces, and recognizable images. I ask them to think about what colors they connect with each feeling and then what lines, shapes, and gestures could express that feeling. For the “how you feel today” image, I let them know that this may be one of the feelings that they already drew, it may be a combination of feelings, or it may include feelings that were not already explored. At the end of the exercise, we look at all of the pictures together, exploring how they are similar or different and discussing how the clients is feeling today. I also often ask clients which feelings were easiest or hardest to do and how they felt while they were working on it. 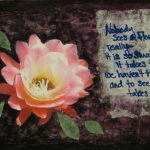 Some thoughts about materials – Oftentimes when I do this art exercise, I leave the media choice up to clients. However, if you want to encourage greater affective expression, keep in mind that availability of vivid colors and fluid media will help with this. 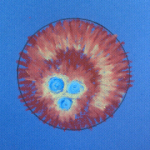 I enjoy doing this activity with paint or chalk pastels. 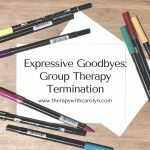 If you need to encourage greater containment for your clients, feel that too much emotional expression will be overwhelming for your client, or need to prevent the possible regression that can occur with fluid media, consider offering more structured media like colored pencils and markers. Keep in mind that paper size can have an impact as well. Smaller sheets of paper will help provide more containment and sense of security (and may also help clients feel more comfortable with doing quick images). I want to acknowledge that this sequence of art prompts is not fully original. This 6-step art process that I have been using was greatly influenced by suggestions given in Expressive Therapies Continuum for working on the Affective Continuum (Hinz, 2009). 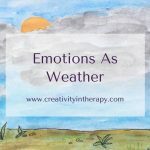 Lisa Hinz shares about using warm-up exercises to enhance affective art and explains directives like “mood states/mind states” and using art to differentiate between the four primary emotions. 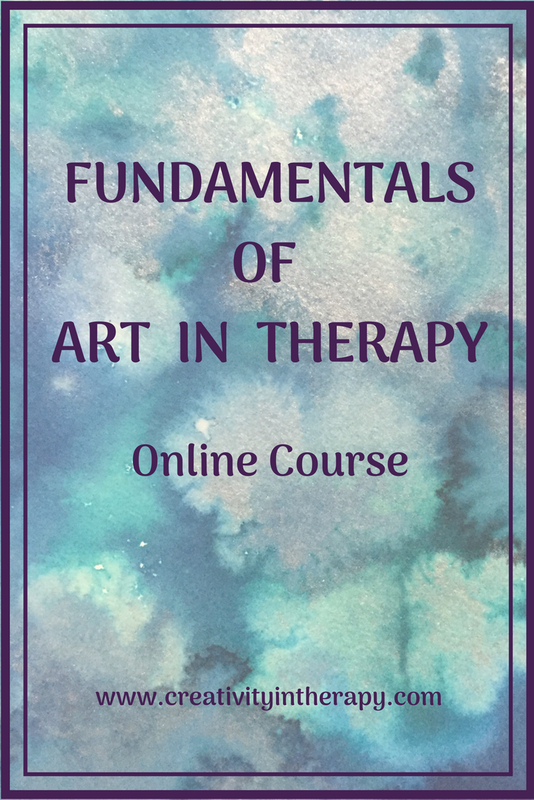 Many other therapists have developed art directives or art-based assessments that are excellent methods for helping clients understand and express emotions. I think it’s great when we have several options or are able to be flexible in the way we use different directives so that we can tailor our work to what is right for our clients, instead of relying on a “one size fits all” approach. Here are my personal responses that I recently did (excluding the scribble), using Mungyo Aquarelle Water Soluble Oil Pastels. Share your thoughts in the comments! What’s your favorite directive to creatively explore feelings? Did you try the 6-image sequence and how did it go? Thanks so much for sharing this! I was just thinking I needed something for a new client who speaks very little English and this will be perfect! Love your website and all the work you do. Thank you so much! I’m glad that this will be helpful for you and your client. Great post ! 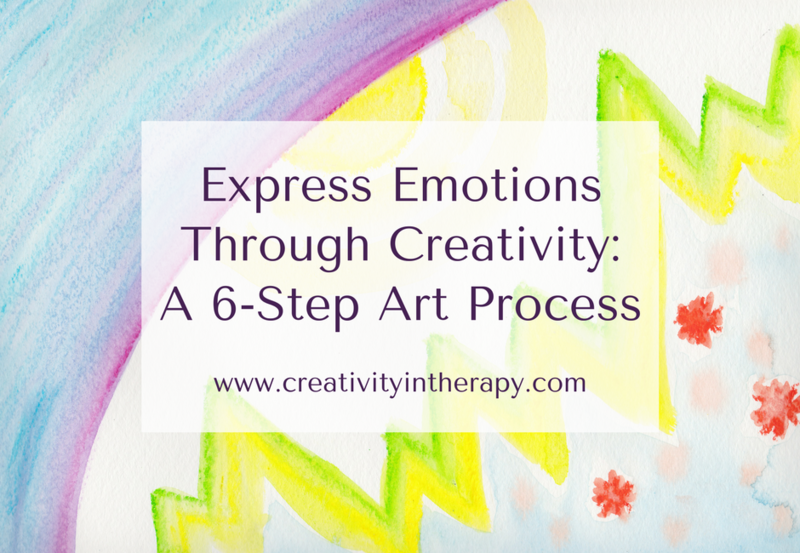 6 step art process helps client go through our basic emotions and practice them. By practicing each emotion inside the clients can compare them and learn different states. Very helpful post. I love this idea and can’t wait to use it with a teen. I think this could definitely benefit someone who struggles with expressing their emotions. Hello Dayna – thanks for reading and glad it seems helpful for your teen client. if you had to organize certain everyday emotions into color categories, which color would you associate with each emotion? It can definitely vary from person to person and can be culturally influenced. Most commonly, I see yellow, blue, purple, and pink show up for happy. Red and black are frequently used for anger. Anxiety is often yellow, green, and orange or a mix of various colors. And dark blue, purple, black, and gray seem to be common for sadness/depression. Thank you for sharing these activities. I am a social worker and I was looking for some tools to use with children/teens to get more in touch with their emotions. This is very helpful! Hi Julia, glad that you found it helpful! Thanks for reading the blog.